Hello and welcome to the 693rd installment of the SWD. Improvised explosive device wounded three elements of the Free Syrian Army’s Firqat al-Hamza in the village of Al-Basouta in Afrin region. On 7 Feb 2019, Syrian Democratic Forces (SDF) and Internal Security Forces implemented sweeping operation as well as common raid campaign inside Raqqa city, targeting the hidden terrorist groups and their secretive locations. Our forces could arrest 63 terrorists who were involved in many terrorist activities. However, these hidden groups are responsible directly on spreading chaos, fear and disputation among city population. Accordingly, SDF and internal security forces keep committing to maintaining peace, safety and stability. Militias loyal to the Government of National Accord under the leadership of the newly-appointed commander of the Sabha Military Region, Lieutenant General Ali Kanah launched an attack against the Libyan National Army in the city of Awbari. Libyan National Army reportedly managed to repel the attack, even though the militias reportedly received assistance from Azwad Awbari group. Two elements of the Libyan National Army were killed and four wounded, while six elements of the militias were killed and three wounded in the clashes. 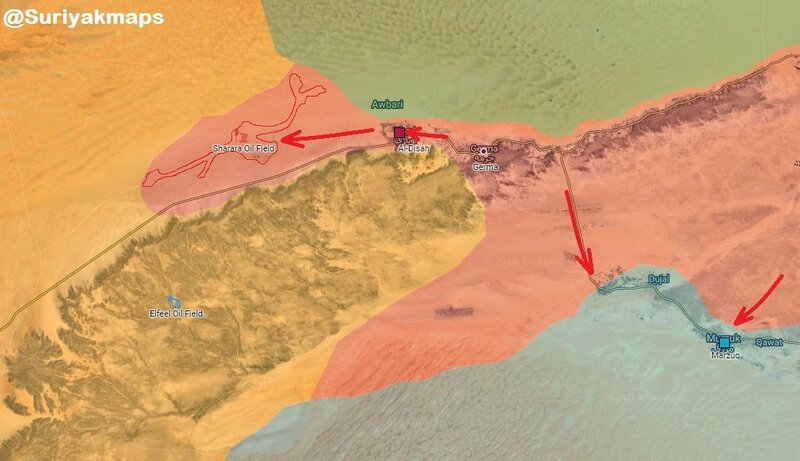 Militias loyal to the Government of National Accord attacked the Libyan National Army’s positions in Al-Sharara field, after the latter captured the field yesterday. Clashes between the two still continue with reports saying that five elements were killed and 16 wounded in the clashes. Afghan National Security Forces wounded three elements of the Islamic Emirate of Afghanistan (Taliban) in Qarabagh district. Islamic Emirate of Afghanistan killed six and wounded three elements of the Afghan National Security Forces during clashes in Deh Yak district. Afghan National Security Forces killed five and wounded two elements of the Islamic Emirate of Afghanistan, as well as destroyed two positions, eight motorcycles, and several weapons depots and ammunition caches in Deh Rawud district. Islamic Emirate of Afghanistan overran an Afghan National Security Forces’ post in Chakhansur district. Five elements of the Afghan National Security Forces were killed and five wounded in the encounter. Islamic Emirate of Afghanistan seized an armored personnel carrier, a DShK heavy machine gun, and two assault rifles from the post. Afghan National Security Forces killed 13 and wounded one element of the Islamic Emirate of Afghanistan and destroyed a vehicle in Sangin, Nahri Saraj, and Musa Qala districts. Islamic Emirate of Afghanistan’s snipers killed two elements of the Afghan National Police in Nari Manda area of Nad Ali district. In today’s report, as in many other ones, the translation from the original language to the English word “however” is not correct.